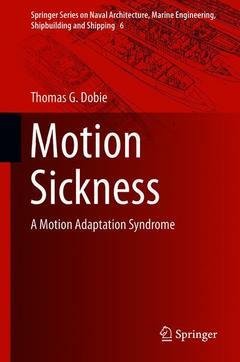 Motion Sickness Dobie Thomas G.
Add to cart the livre of Dobie Thomas G.
This book offers a survey of the state of the art in the field of motion sickness. It begins by describing the historical background and the current definition of motion sickness, then discusses the prevalence among individuals, along with the physiological and psychological concomitants of the disorder. It reviews the incidence of motion sickness in numerous provocative motion environments and discusses various personal factors that appear to influence this aspect. Various characteristics of provocative motion stimuli are also described, together with the results of studies conducted in the laboratory, on motion simulators and at sea. Laboratory tests that could potentially be used to assess an individual?s susceptibility to motion sickness and his or her ability to adapt to motion environments are presented in detail, together with the ways in which individuals might be trained to prevent motion sickness or more effectively cope with motion environments. In closing, the book reports on the cognitive-behavioral approach developed by the author (Dobie, 1963) as well as the various desensitization programs employed in military settings, and discusses the relative effectiveness of these methods in comparison to cognitive-behavioral counseling. Motion Sickness.- Incidence Of Motion Sickness.- Correlates Of Susceptibility To Motion Sickness.- Characteristics Of The Provocative Motion Stimuli.- Physiological Mechanisms Underlying Motion Sickness.- Psychological Mechanisms That Exacerbate Motion Sickness.- Adaptation To Provocative Motion.- Prediction Of Susceptibility To Motion Sickness.- Prevention Of Motion Sickness.- Pharmacological Treatment Of Motion Sickness.- The Use Of Non-Pharmacological Therapy. Thomas Dobie is Professor, Director and Human Engineering Head of the National Biodynamics Laboratory, College of Engineering, at the University of New Orleans. He has also held the posts of: Research Professor in Mechanical Engineering and Clinical Professor in Psychology at the University of New Orleans; Adjunct Professor in the Department of Cell Biology and Anatomy at the Louisiana State University School of Medicine in New Orleans; and a Principal Research Fellow in the School of Biomedical Sciences, at the University of Leeds, in Great Britain. When he was in the British Royal Air Force (RAF), Thomas Dobie found that many keen young flight trainees had been grounded permanently with a diagnosis of chronic intractable airsickness,‖ because there was no satisfactory programme for dealing with their problem. He originally developed his cognitive-behavioural anti-motion sickness desensitisation training programme, while serving as a medical officer (pilot) in the RAF Flying Training Command. He was later invited as a visiting scientist on assignment to the Motion Sciences Department of the Naval Biodynamics Laboratory at the University of Leeds, in UK and appointed Clinical Professor in the Department of Psychology, at the University of New Orleans. At that time he carried out experiments designed to evaluate the key elements of his cognitive-behavioural anti-motion sickness training programme with Dr. James May, who held the Villere Chair in Neurosciences, in the Department of Psychology, at the University of New Orleans. The programme was funded by the United Kingdom Admiralty Research Establishment and the United States Office of Naval Research. Thomas Dobie has long been intrigued by the number of famous and gallant people who have suffered severely from motion sickness, none more so than Charles Darwin.